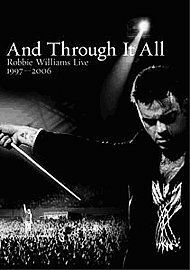 ROBBIE WILLIAMS - AND THROUGH IT ALL - LIVE 1997-2006 (2DVD) | Online Shop | Wizard LTD. Album: "AND THROUGH IT ALL - LIVE 1997-2006 (2DVD)"
Double DVD live retrospective from one of the world's greatest performers, spanning his entire solo career 1997 - 2006. This DVD includes rare footage from The Forum, London (1998), the worldwide phenomenon that is Angels, intimate recording session at Abbey Road in 2003 for BBC Radio 2, highlights from his Live In Berlin spectacular and live shows at Slane Castle, K”ln and Manchester. Even includes a guest spot on David Letterman's Late Show and Otro Rollo, while footage from the UK includes an appearance on Later with Jools Holland, a duet with Kylie Minogue on the iconic chart show Top of the Pops', his powerhouse 'Full Monty' medley with Tom Jones at the 2000 Brit Awards and a recent festive performance with Ant and Dec.